In many respects, youth and confidence go hand and hand. Despite the financial challenges of the past decade, many women, especially those under 30, still maintain an optimistic view of their financial future. As part of the POPSUGAR Insights 2017 Personal Finance Report, we surveyed nearly 2,000 women between the ages of 18 and 44 to ask them how they manage their finances and think about their financial future. Overall, 64% of women under 30 are confident about their financial future and are 21% more confident about their financial future than women between the ages of 30 and 44. Women over the age of 30 are more likely to be neither confident nor unconfident or somewhat unconfident. 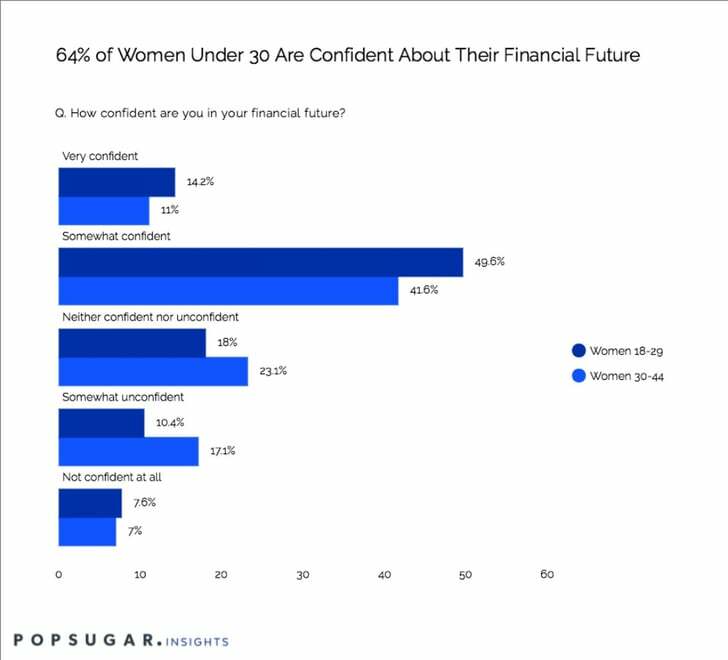 Interestingly, this overall sense of optimism for women under 30 does not cover every segment of the population as we learned 7.6% of women under 30 are not confident at all about their financial future, 8% more likely to feel that way than women aged 30 to 44. Of course, it may be the case that those who lack the confidence were those women most negatively impacted by the recent downturn in the economy who have not yet been able to bounce back to their pre-recession confidence levels and therefore need help and support to get back on the path to success. The opportunity for brands is to offer content to women on both sides of the confidence spectrum, and create age and life stage-themed advice to ensure they are setting themselves up for financial success in both the short and long term. Turning confidence into action is important here, helping women focus on taking the necessary steps to ensure that their future life goals are achievable. For women with less confidence, identifying the reason behind the lack of confidence is crucial. From there, brands can help women turn fear into knowledge to help them overcome information gaps, take steps to turn around financial missteps, or simply get them on the path to a successful financial future.